Here is the full report (and the bank-by-bank results) from the latest Spanish bank stress test exercise. Below we provide the key points and our initial thoughts on them. 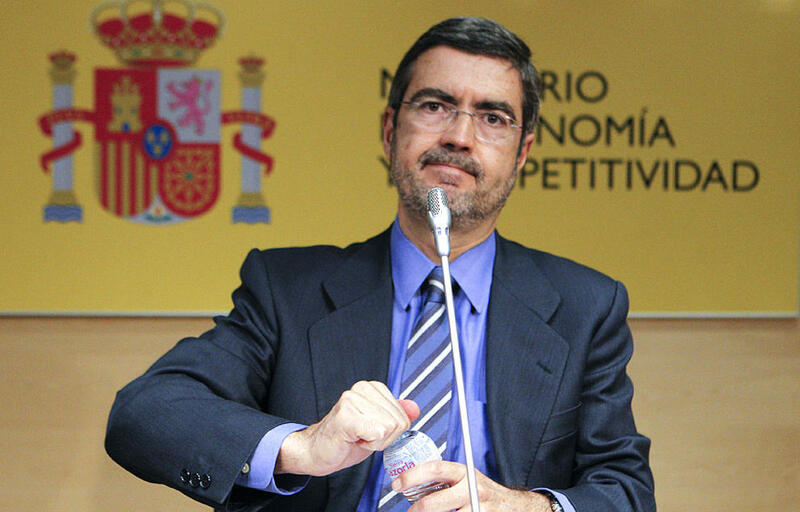 The tests put the total capital needs of Spanish banks at €59.3bn, but Spanish Deputy Finance Minister Fernando Jiménez Latorre (in the picture) just told journalists during the press conference that, assuming that Spanish banks manage to raise part of the money from other sources, the Spanish government could ask the EFSF for "around €40bn" (as we anticipated here). Cumulative credit losses for the in-scope domestic back book of lending assets are approximately €270bn for the adverse (stress) scenario, of which €265bn correspond to the existing book. This compares with cumulative credit losses amounting to approximately €183bn under the base scenario. The base case scenario seems overly optimistic, the adverse scenario looks more realistic - although we expect a fall in house prices of around 35% rather than the 25% assumed. The prediction that unemployment will peak at 27.2% also seems optimistic given that there is plenty more austerity and internal devaluation to come while the structural labour market reforms are yet to take effect. These tests do look to be more intense than the previous ones but ultimately the optimistic assumptions do instantly raise questions over their credibility. The structure of the bailout request is also unlikely to enamour investors, who like to see grand gestures, however, it always positive that taxpayer participation may be limited. 1. The whole set up stinks. What it should do is assure that lenders want to lend again to these banks. What they do is go to some percentage. basically useless. Most of these banks will not become again a credible debitor by this. 2. Looks they were working towards 60 Bns that was earlier mentioned. And adjusted variables to get there. as profits to be made and on very unrealistic macro figures. Simply looks totally unrealistic. 4. Deleveraging also for a similar amount. Simply doesnot fit in the total picture. Why provide all sorts of ECB goodies when they need substantially less funding (and capital as that is where it is all about in this test). Looks amateurish and completely inconsistent to have one part of your system increase banks' lending capacity while for the test you assume that to be decreasing. 5. Spain 20 Bn. Possibly double as a part likely will be in the deleveraging part. 6. So in a nutshell 150 Bn or so looks more realistic and even for that amount we would have to see how lenders react. 7. Basically the Spanish bankingsector needs a big clean up. You donot see banks labelled for break up. So it is both keeping too many players in a declined market and likley keeping garbage alive. I'm not sure if checking his previous work would be considered to be playing the man instead of the ball? Oliver Wyman has some controversies in his past regarding banks Ccitigroup and Anglo Irish Bank)and their profitability/stability/viability. Was/is he really the best suited for the job to analyse Spanish banks? Interesting. If the Spanish government 'only' asks for 40bn, will they still claim entitlement to the entire 100bn previously agreed and ask the ECB to perform OMT with the remaining 60bn? Many thanks for the comment Gabriel. It's an interesting question, which is yet to be fully answered. Spanish government officials have hinted that such a request could be made, but the EFSF head Klaus Regling has made it clear that such a request would require a separate new Memorandum of Understanding (likely with fiscal conditions) and therefore could for all practical purposes be the same as asking for a sovereign bailout programme. Spain is slightly different than other countries in that its autonomous provinces also have substantial debt. Did I not read that Andalusia had a debt of more than 800 billion Euros? Rajoy does not want a bailout, becuase this entails Spain being colonised by the EU; but the regions ask for him to bail them out, which he cannot do. It is just more can-kicking: Spain is going bust and the longer they go on getting worse, the worse they will get. Point I missed. To solve the bankruns especially the solvency of the banks is relevant. Meaning its exposure to sov debt and unclear (likely too low) provisions for bad debt. This latter part is not properly solved. Accountinmg for bad debt is still more or less 'do as you like'. Sov debt is even bought iso exposed of and simply doesnot carry sufficient provisions. Seen the yields average maturity 6-7Y probably has roughly 20% of the value (chance times estimated haircut) as problems in it. May be even worse if Spanish debt is valued at nominal (because of held to maturity). First of all provisions for that are insufficient. Second banks are enormously overexposed to sov debt. If something goes wrong with the State banks are almost sure to follow. A Catch22 save the banks next to more capital you also need banks to sell off massively sov debt. And dump the State in an even bigger hole than that it is in already. This way the bankrun will not stop, which is the main issue.